If we’re being honest, when I bought my crimson paella pan with the swirly handles, I didn’t even know it was a paella pan. I just thought it looked nice and I had a vision of it sitting juicy and pristine on my white tablecloth-clad dining table. I was paying for my objet d’art when the vintage store cashier asked when I would be making my paella. Paella! Riiiiiiiiiight. I still didn’t run home and cook with it. It lay dormant in my apartment for two years, looking lovely all the while. Then I moved, it came with, and sat unused again for a full three years after I unpacked it. It wasn’t that I didn’t like paella, it was just one of those things that I gave up when I gave up eating animals. I’d had meaty paellas and, more often, delicious seafood-stuffed paellas a-plenty. One Spanish friend’s mother always made a fantastic, octopus-studded paella on birthdays and I made sure to attend every party. I didn’t really care to make a vegetarian paella because I didn’t think it could complete with my memories. But then, as often happens, those memories stirred a craving and I had to, had to attempt a vegetarian paella. And it had better be good. That depended on two things. Ensuring that is be beautiful, and really that wasn’t hard. Stud the rice with almost any in-season summer produce and the job is done. I keep saying “stud” since, unlike a risotto, you don’t stir paella. You’re attempting to create the coveted, crispy-rice crust at the bottom, called a soccorat. To do so, simmer the paella gently, or the liquid will evaporate too quickly and the bottom will burn. Watch carefully that the steam doesn’t turn to smoke—your warning that your soccorat is crossing that fine line. 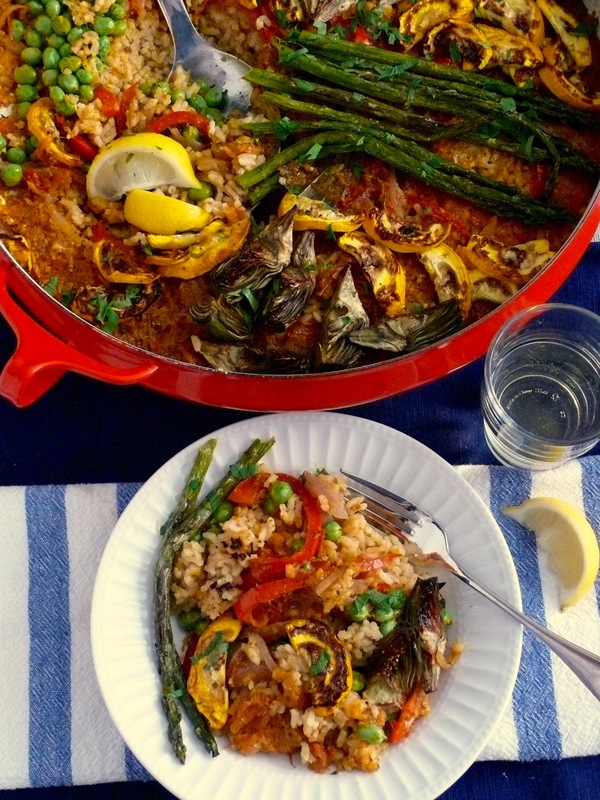 Seafood, like mussels or shrimp, cook right on top of the paella, but other ingredients are often par-cooked or browned first before being added, like in this recipe. Second, to be a success, the paella needed to be flavourful throughout, which comes down to the stock. Here, that’s just a matter of pureeing some vegetables into a paste that infuses the water and steam its way into every kernel of rice. And about the rice: Bomba or Calasparra rice is argued to be superior to, say, Arborio rice, and the texture is a little different. Bomba is a bit of a splurge, but then again, you don’t need much. Your choice. Fear not if you don’t have a paella pan, just use your widest skillet. 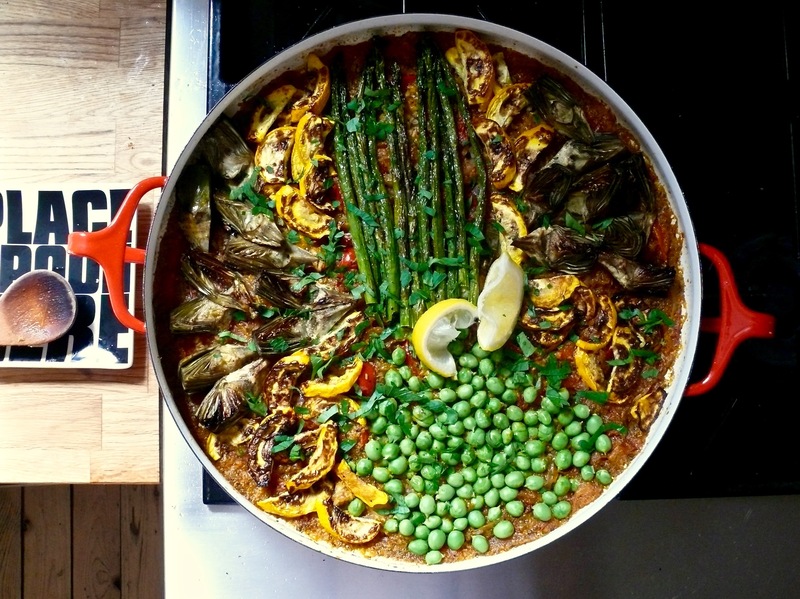 It’s your paella that will be centrepiece-worthy, not the pan. I have a very similar looking dish (in yellow) but I always thought it was too thin to put on direct heat so we’re using it as a fruit bowl. I wonder if it’s for paella too! This is brilliant. I made this for lunch and can’t have enough of it. I had a bit extra of the veggie paste so I have frozen it. Not one thing should be changed in this amazing recipe. thank you, samarpita. it means a lot to me–i really test and retest the recipes, especially involved ones like this, to make sure they dont disappoint. im so glad you enjoyed it!